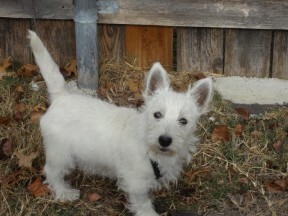 When the little Westie puppy came to live with an older woman, he was a happy boy but a handful. His new mom realized quite quickly that she could not provide the best home for him, especially living in senior housing and on the second floor. With some health problems, she simply couldn’t go up and down the stairs as often as the little puppy would need, so she called Westie Rescue of Austin Texas and asked them to find him a good home. Coming into rescue at just three months old, the puppy was not up to date on his shots and of course, had not been neutered. In time, he was properly vetted and ready to find a new home, hopefully one that could keep up with his playful personality. 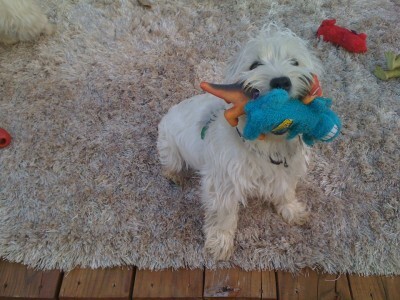 Teri had adopted a female Westie from the Austin rescue two years ago. Frannie had had a litter of puppies with a backyard breeder, but the puppies were taken from her and sold as quickly as possible. Teri noticed early on that Frannie seemed to miss being a mom so a puppy for her to raise would be ideal. However, puppies are few and far between with most rescues so Teri and Frannie had to wait and keep hoping for their puppy to come along. Shortly after taking in the little Westie boy, Linda from Westie Rescue of Austin, Texas happened to meet Teri while out shopping. Teri reminded Linda that she and Frannie were still interested in adopting a puppy and the wheels began to turn. Several days later, Linda called Teri and arranged a “meet and greet” between the puppy, Teri, and of course, Frannie. It was the beginning of the Christmas season so perhaps all the joy and excitement of that time of year had an effect, because Frannie took to the puppy immediately. Of course there was some initial shyness on the puppy’s part, but very quickly the two Westies began to play with wild abandon. Seemed like a perfect match! However, Teri had a vacation trip planned and would be away over the holidays. When Linda learned that Teri would be traveling over the holidays and not able to take the little pup right away, she was not dismayed. Boi, named by Teri from a childhood nickname used by her son, got to spend the holidays with Linda and her gang. “It was wonderful to have a puppy in the house for the holidays and then, at the start of the New Year, he went to his forever home with his new Moms, both human and canine,” said Linda. Frannie is proving to be a good teacher, just as Teri had hoped. 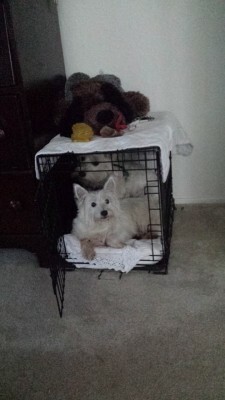 Once, when Boi had chewed up something of Teri’s, she put him in his crate for a time out. Frannie, either to reinforce the learning experience or to keep Boi company, squeezed into the crate with him. This year, Boi is past his first birthday which, because they didn’t have a record of his exact birth date, Teri set as the same day as her own birthday in September. He’s a full-fledged adult and he and Frannie are more than ready to celebrate the holidays. 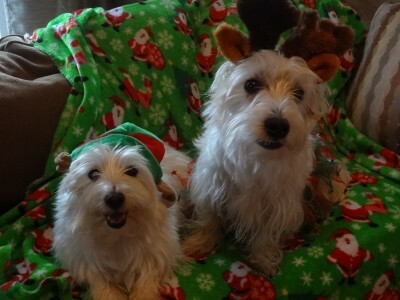 Check out the Christmas one of the photos that Linda and Teri took of the two Westies dressed in holiday gear. If you would like to learn more about Westie Rescue of Austin, volunteer, apply to adopt a Westie or donate, check out their website. Update on Kenner: Recently we did a story about another Westie rescue, Kenner, who has pulmonary fibrosis or Westie Lung Disease. He has recently had a full check-up and continues to do well.